"By adding Portus to our Made2Manage ERP, we no longer felt the need to undertake a costly transition to a new ERP solution – we now have a leading-edge business system on par with and beyond much more expensive options." -Joe O'Neil, President Hunter Technology, Inc. Take our 30-day risk-free trial » We combine decades of manufacturing expertise with advanced software development capabilities to produce game-changing business intelligence and workow automation solutions for manufacturing companies. Our solutions are revolutionary because we have fully automated the entire process of converting your transactional data into content rich, interactive web pages with continuous drill down. If you use a major ERP platform (like the ones below), we can oer you a turnkey solution with immediate time to value. 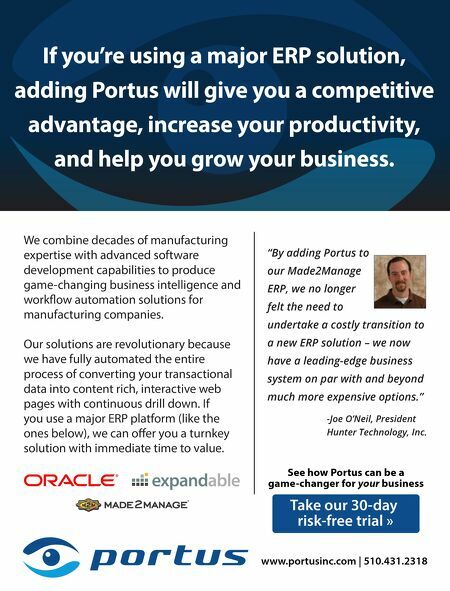 www.portusinc.com | 510.431.2318 See how Portus can be a game-changer for your business If you're using a major ERP solution, adding Portus will give you a competitive advantage, increase your productivity, and help you grow your business. Short — I-Connect Survey: Automation or Reducing Process Steps?